Click here for a list of our 2017 activities. In collaboration with Books and Books, The Miami Book Fair Year-Round, Orange Island Foundation, Reading Queer, The Little Haiti Cultural Center, and Undergrounds Coffeehaus, The Whimsical Project is proud to announce the2016 Caribbean Series. BECON-TV is running a marathon of the New Haitian Generation on May 18, 2016 in honor of Haitian Flag Day as well as Haitian Heritage month. Please tune in and watch. Here is a list of times that different shows that will air on WBEC-TV 63/Classroom Channel 16/Cable 19. 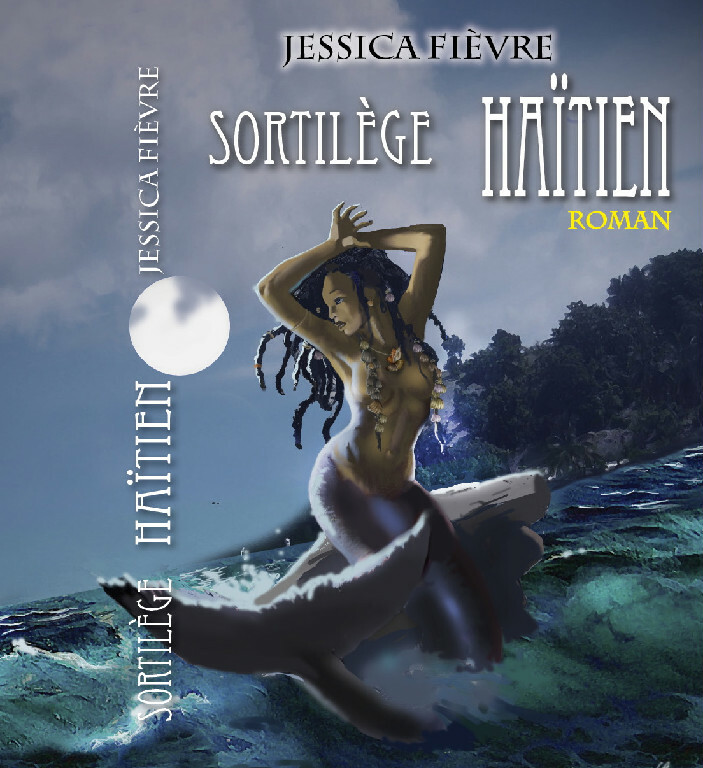 On May 15, Orange Island Arts Foundation is happy to celebrate Haitian Heritage Month with writers M.J. (Jessica) Fievre and Marie Ketsia Theodore-Pharel. Doors of café open at 4pm. Marie Ketsia Theodore-Pharel was born in Port-au-Prince Haiti, and currently lives in Homestead, Florida with her children and husband. She earned a bachelor’s from Tufts University and a master’s in English from UMass Boston. 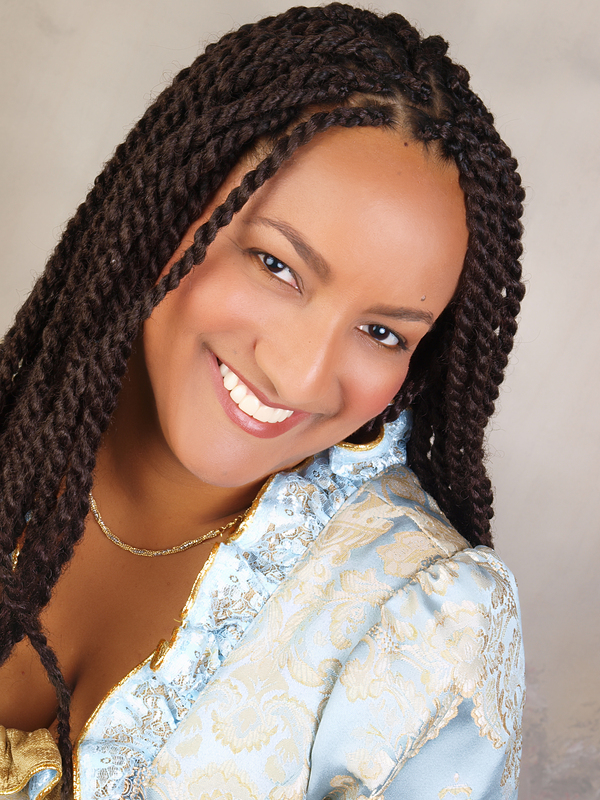 Her most recent publications include “Kako Blood” inThe Caribbean Writer, 2011; “Mercy at the Gate” in the acclaimed anthology Haiti Noir, edited by Edwidge Danticat in 2011; “Haiti: a Cigarette Burning at both Ends” published in Butterfly Ways: Voices from the Haitian Dyaspora in the United States, edited by Edwidge Danticat. Her children’s books include Beauty Walks in Nature(2010), Songs from a Tower (2009), Keeper of the Sky (2007), One More Daughter, America (2006),Daughter of the House (2005), A Fish Called Tanga (2003), I’ll Fly Away (1999). Her short stories published in magazines include “The Mango Tree” in Compost Magazine (1994); “Light Chocolate Child” in Onyx (1995), and “Soup Joumou: Diary of a Mad Woman,” in African Home front Magazine (1996). A Sky the Color of Chaos is available for check out through the Palm Beach County Library System. 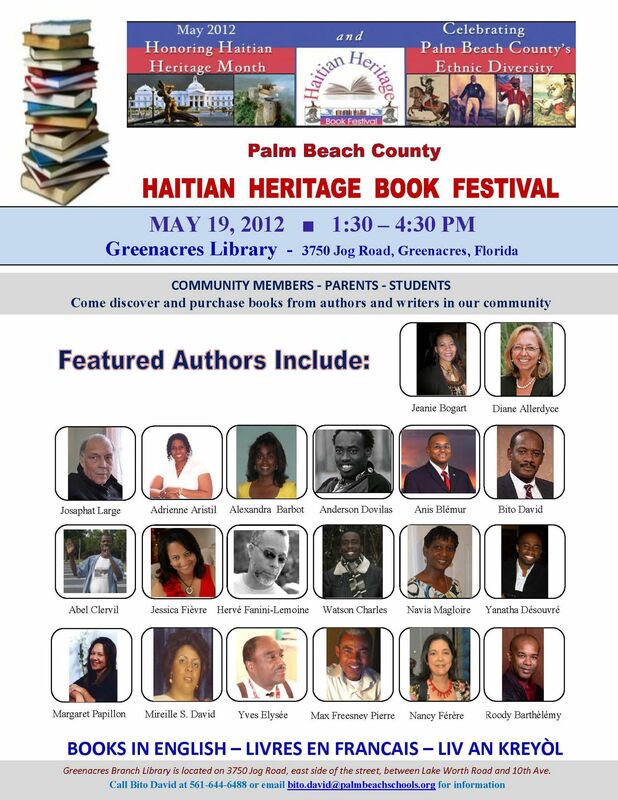 Please encourage your friends and students to read the book and join us for Haitian Heritage Month. My Book Talk is scheduled for Saturday, May 14, 2:00 pm at the West Boynton Branch on Jog Road. Here’s the link to view the book availability by location. Do not miss “Shadows of Hialeah,” a poem-turned-into-play, written by M.J. Fievre, directed by M.J. Fievre and Mahalia Solages, and performed by Chasity Hart, Charity Hannah Grace, and Guy-Marcel Jr Lilavois. Two drummers (including Grecia Garrett) from the legendary “Venus Rising: Women’s Drum & Dance Ensemble” will be part of the show. The performance is part of POETRY PRESS WEEK. Remember to RSVP: it’s going to be a full house! The production of “Shadows of Hialeah” was made possible by generous backers. Poetry Press Week premieres for the first time outside Portland, OR as part of the O, Miami Poetry Festival on April 22 & 23, 2016. Ten poets over two nights will present new poetry to an audience of leading literary editors, press, and the general public. Work presented will be immediately available for publication. Poetry Press Week presentations borrow from Fashion Week, using models and stylized concepts to present a three-dimensional, full-sensory experience of a poet’s work. 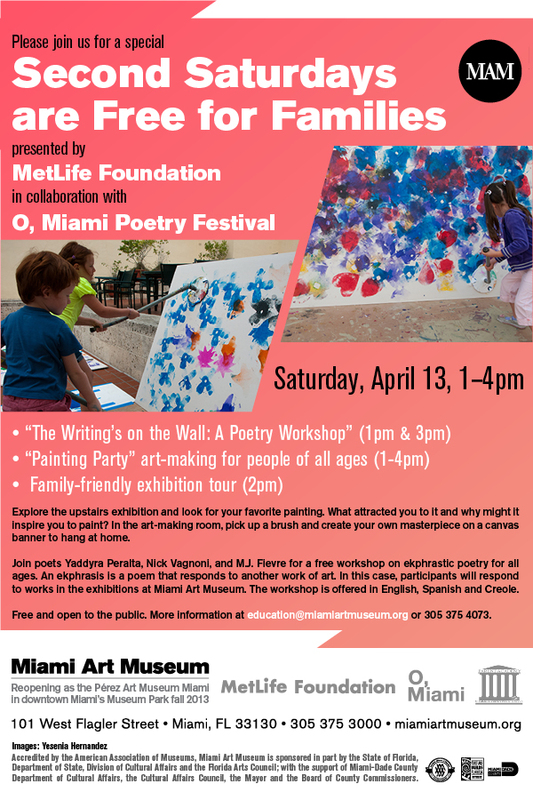 For the month of April, O, Miami Poetry Festival endeavors to deliver a poem to all in the Miami-Dade County. In support of this commendable initiative, Aesop Coconut Grove is pleased to host an installation representing the meters of poet M.J. Fièvre’s ‘On Charles Avenue.’ Suspended sheets of pencils are sensitively arranged to form five panels – defining the poem’s five stanzas into distinct fields of depth. These panels establish undulating contours and dramatic intersections, illustrating the poem’s rhythmic movement, and the cadence of significant verse. Visitors are kindly invited to the Coconut Grove store from Friday, April 15 to Saturday, April 30 to experience the installation. Not all ills are corporal in nature. During the month of April, poetry professionals at Jackson Health Systems Pharmacy are issuing a different kind of prescription: pill bottles containing contemporary poems in English, Spanish, and Creole. After being “diagnosed,” pharmacy volunteers give each interested visitor to the pharmacy a “poetry prescription” that contains one poem in the language of the patient’s choosing. 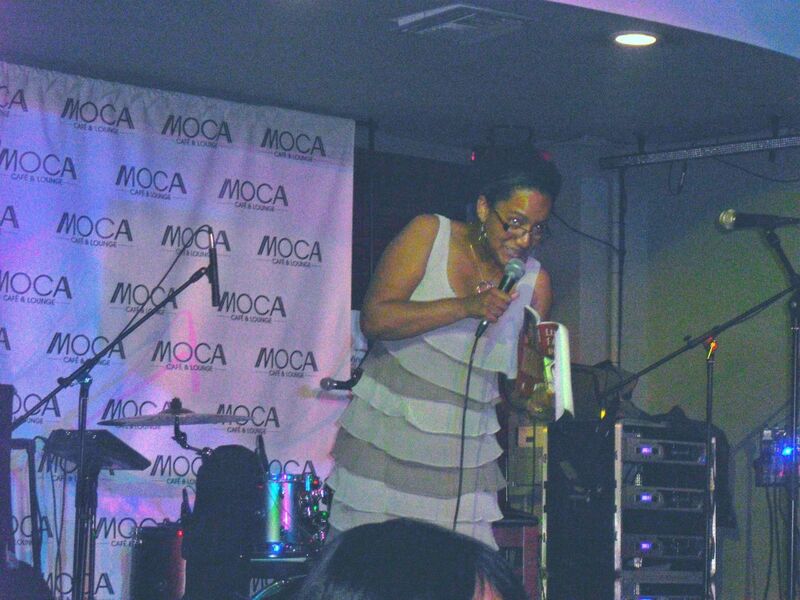 Poems in English were curated and chosen by award-winning poet Gabrielle Calvocoressi, while the Spanish and Creole poems were written specifically for this project by Miami poets Yosie Crespo and M.J. Fievre, respectively. Poetry prescriptions will be given out all April, or until supplies run out. When you memorize a poem, the poet’s art becomes a part of you. When you speak it aloud, it resonates through your body and connects to others. It seems a fair exchange then: the art of a poet for the art of a barber, and you, Miami, the vessel for them both. For one day, April 15, Miamians can recite Calvin Hernton’s The Distant Drum at select area salons and receive a free haircut in exchange. Participants are also asked, if and when someone asks about their haircut, to recite the poem again, as well as to post their haircut on social media with the text of the poem and the hashtag, #poemforahaircut. For this event, a Haitian-Creole translation of Hernton’s poem is being provided by M.J. Fievre. […] Thank you for translating “The Distant Drum” into Creole. It [will make the] project […] more accessible to the barbershop community at Bless the Lord Barbers, in Little Haiti. Here’s a photo of the owner, Mr. Oscar Joseph, Melody, and yours truly. I am very grateful to you. M.J. will appear as a guest on the BECON-TV television program “The New Haitian Generation,” which highlights and showcases successful Haitian-Americans. Guests on the program include professionals from all walks of life including physicians, representatives from local organizations, athletes, entertainers, nationally known celebrities and government officials. 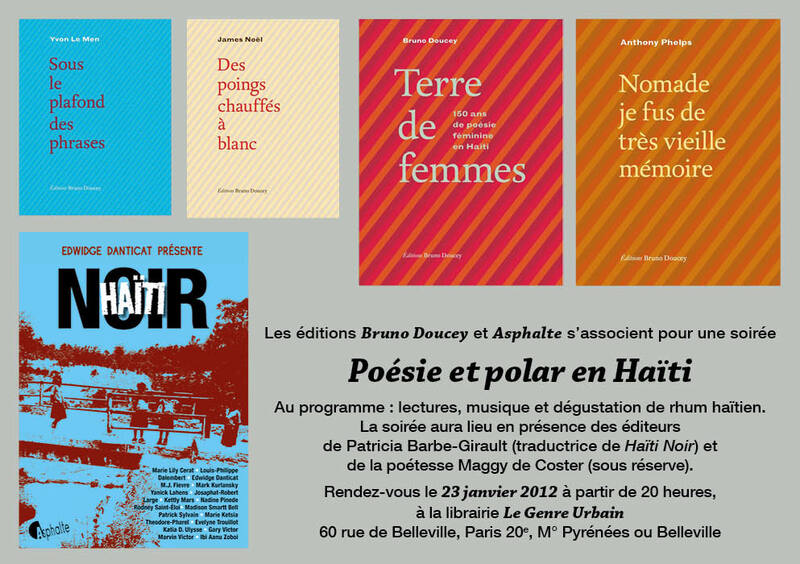 Three women from Haiti will read and discuss poems that examine the physical, sociopolitical, canonical, and psychological kinds of exile endured by women writers of Haitian Descent. Poets Rebecca N. Carmant, Angie Bell, and Naomiel in conversation with M.J. Fievre will probe the complex issues of race, nationality, gender, sexuality, and class that limit (or enrich!) their lives as expats. Authors Perspective on Haiti. Discussion tied to a photographic exhibit (“From Within and Without:The History of Haitian Photography”) at the NSU Art Museum. Exhibit on display ’til October 4, 2015. In this eavesdropping snippet of a jailhouse call, Silas gages the status of his relationship with his girlfriend Jackie. To Accept, Dial 5 Now (written by Michèle Jessica Fièvre and directed by Gladys Ramirez) is a story about violence, jealousy and control, the choices we make, and the limits of love. Actors include Chasity Hart as “Jackie” (left), Jovon SingaBoy Jacobs as “Silas” (top right), and Laura Pons as “Recording” (bottom right). MicroTheather Miami will present the one-act play from 8 pm to 11 pm in the courtyard inside the Spanish Cultural Center located at 1490 Biscayne Blvd., Miami, FL 33132. You’re invited! I’ll be reading at Books & Books with several 15 Views of Miami contributors, including Lynne Barrett, Evelina Galang, Geoffrey Philp, and John Dufresne. Poem Depot: Poetry on Demand, with Miami Poetry Collective: You bring the inspiration, MPC provides the verse — and the old-school typewriters. When: The event is on December 18th from 6:30 to 9:30. What: This is a Lotus House Fundraising event. Amigos de Santa Cruz, les invito a mi charla en el Centro Cultural Simón I. Patiño. Conferencia en francés (con traducción). “MYTHES ET LÉGENDES DANS LA LITTÉRATURE ANTILLAISE FRANCO-PHONE” (Mitos y leyendas en la literatura francófona de las Antillas). 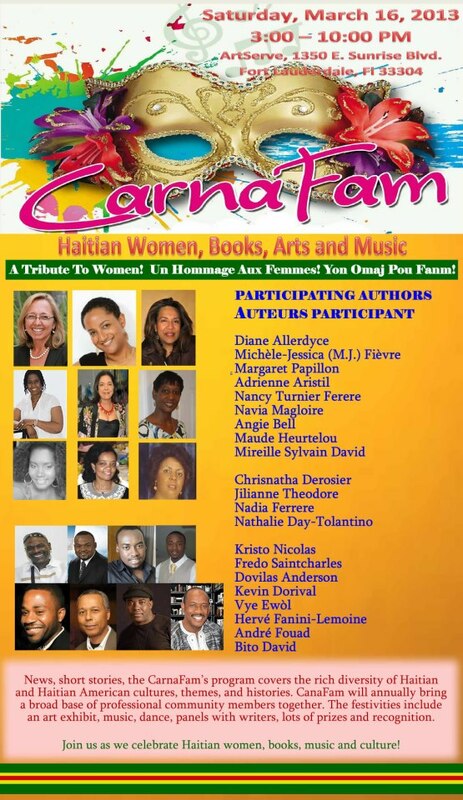 Powerful, beautiful women of Haitian descent will discuss the stories, articles and poems that pour forth from their Haitian hearts filtered through their American vision, beginning at 4 p.m. on Saturday, July 26, 2014 at the African-American Research Library and Cultural Center. 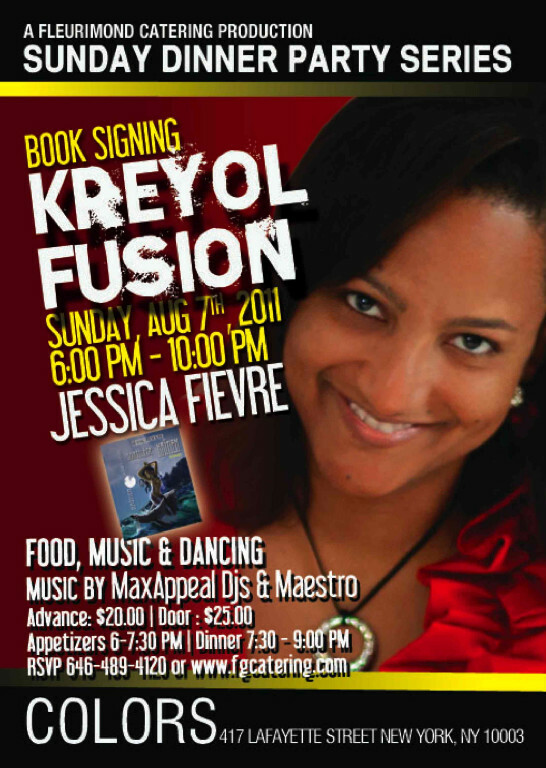 Come meet Mahalia Solages, Marie-Ketsia Theodore-Pharel, and M.J. Fievre! The Betsy Writer’s Room presents a multilingual, multicultural Reading at The Betsy, Friday, June 27 at 6pm in B Bar. Escribe Aqui will feature readings in Spanish with Hernan Vera Alvarez (Argentina), Pedro Medina Leon (Peru), Camilo Pino (Venezuela) and Jose Ignacio Valenzuela (Chile) at 6PM. Write Here will follow, with readings in English by Anjanette Delgado (Cuba), MJ Fievre (Haiti), Mia Leonin (Cuba) and Geoffrey Philp (Jamaica). Special Musical Performance by jazz saxophonist, Nestor Zurita. Books & Books will have copies from selected works available for purchase. Cash bar available. This is a free event. Lit Crawl, a bar crawl with literary readings, officially began in San Francisco in 2006. But really it began thousands of years earlier when the first homo ergaster decided to crawl from cave to cave reading her poems about stone tools and drinking everyone’s beer. Tonight the tradition of drinking and literature takes the next step in its evolution with the first-ever Lit Crawl Miami. At 6 p.m. (sharp! ), pick up your map & schedule at O, Miami host hotel, The Betsy-South Beach, and hear a special reading by two-time Pulitzer Prize finalist Russell Banks and Kingsley Tufts Award-winner Chase Twichell. Then head out into South Beach for a “choose-your-own-literary-adventure” presented by Reading Queer, Mangrove Literary Journal, Rod Deal/Isis Miller, Miami Poetry Collective (That’s where M.J. will be! ), Culture in the City/Famous Last Fridays, Spoken Soul, Next@19th, and Lip Service. 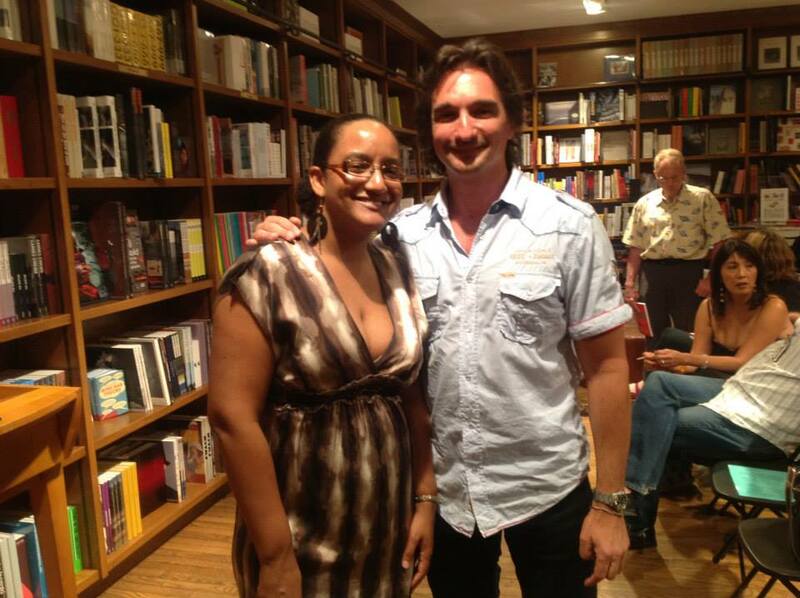 Miami Poetry Collective members will be holding a Poem Depot as part of O,Miami LitCrawl. 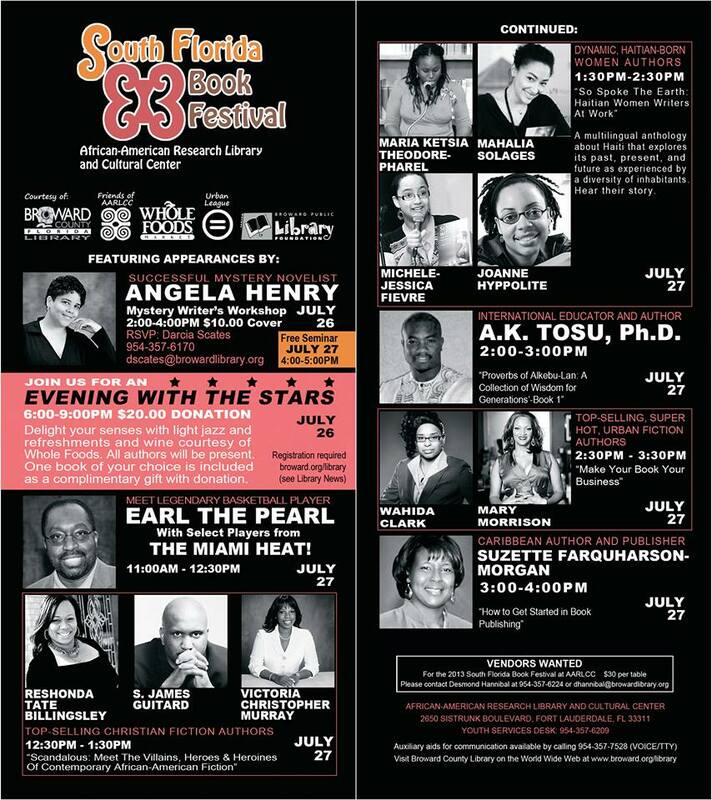 The event will take place at Playwright Pub South Beach 1265 Washington Ave, Miami Beach, FL 33139 . Poets M.J. Fievre,Roy Guzman, Cathleen Chambless, Leenie Mobbs, and Richard Ryal will be taking poetry requests from visitors and typing the poems on the spot (on old typewriters!). In April 2014, Argentinian artist, designer, and cyclist Gabriel Delponte will leave Miami for a year-long bicycle trip through Japan. On his ride, he’ll deliver envelopes of short poems written by Miami poets, as well as poems from writers in Italy, Japan, Colombia, and Brazil. On April 6, several of these poets will read their “Postcards from Miami” at The Edgewater Poetry & Athletics Club Pool Party. For more information on this project, visit BridgeMeJapan.com. Poets include: Luca Artioi, Marci Calabretta, Gabriel Delponte, M.J. Fievre, Ellene Glenn Moore, Michael Hettich, Yaddyra Peralta, Doc Suds, Carol Todaro, and Nick Vagnoni. 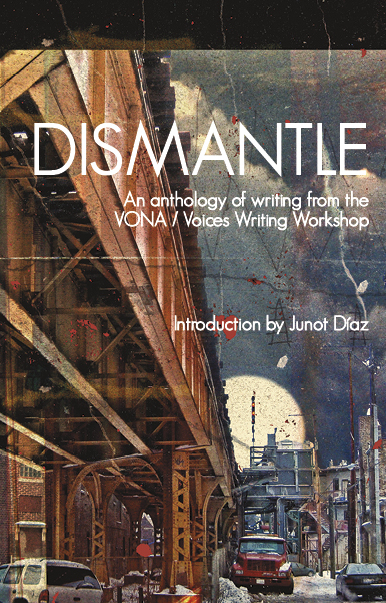 In celebration of VONA/Voices 15th year of amazing workshops for writers-of-color and to herald the arrival of the first VONA/Voices Anthology, Dismantle, from Thread Makes Blanket Press, we invite you to a Reading/Party/Holler on Friday Night off-site at AWP. There will be drinks, but we encourage discreet DL BYOB. We hope you’ll join me (and the Women Writers of Haitian Descent, Inc.) at AWP in Seattle in 2014. 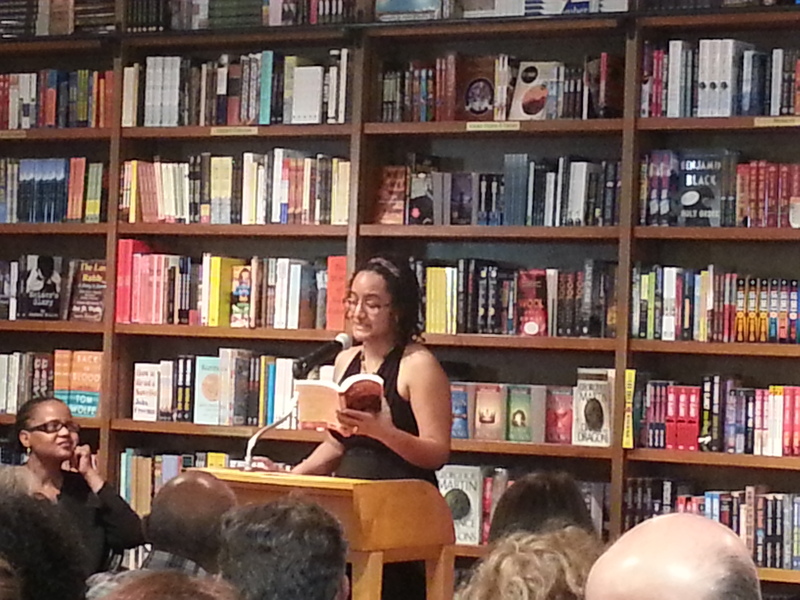 A trilingual reading from So Spoke the Earth, a collection of prose and poetry about pre- and post-earthquake Haiti and published by the Women Writers of Haitian Descent. Authors will share first and third-person accounts and visions of Haiti through various periods of time, and of the moments following the tragedy, exploring stories of the search for survivors and different shapes of grief and hope. Presentations in English, with some French and Haitian Creole (with translations). The original best-selling Haiti Noir comprised all new stories by today’s best Haitian authors. This new volume collects the true classics of Haitian literature—both short stories and excerpts from longer works—and will be an integral piece to the understanding of how Haitian culture has evolved over the past fifty years. Editor Edwidge Danticat, one of the most respected Haitian writers, has a well-deserved sterling reputation, and here she follows on the success of the original first volume. 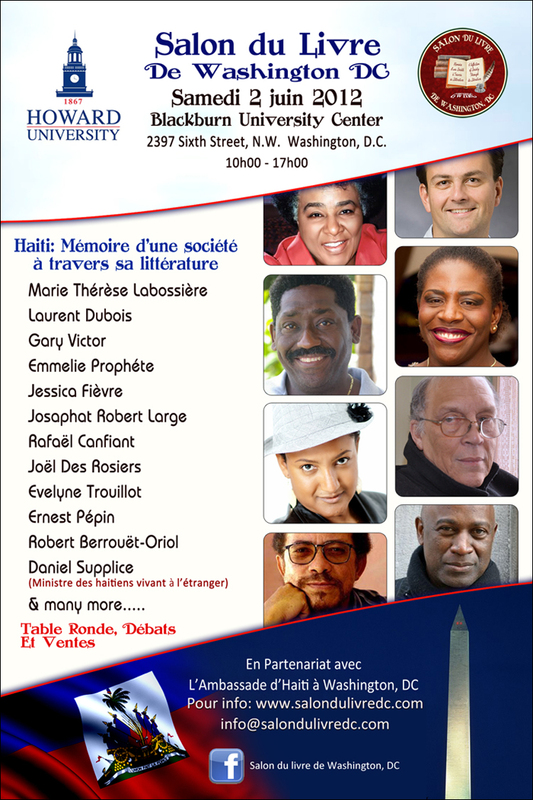 Classic stories by: Danielle Legros Georges, Jacques Roumain, Ida Faubert, Jacques-Stephen Alexis, Jan J. Dominique, Paulette Poujol Oriol, Lyonel Trouillot, Emmelie Prophète, Ben Fountain, Dany Laferrière, Georges Anglade, Edwidge Danticat, Michèle Voltaire Marcelin, Èzili Dantò, Marie-Hélène Laforest, Nick Stone, Marilène Phipps-Kettlewell, Myriam J.A. Chancy, and Roxane Gay. 01/16/2014, 6 – 8 p.m. Writers: Submit original short fiction, poetry, or essays; the eight selected, five minutes in length, will be read at the event. Selected Authors’ Books will be available for sale. 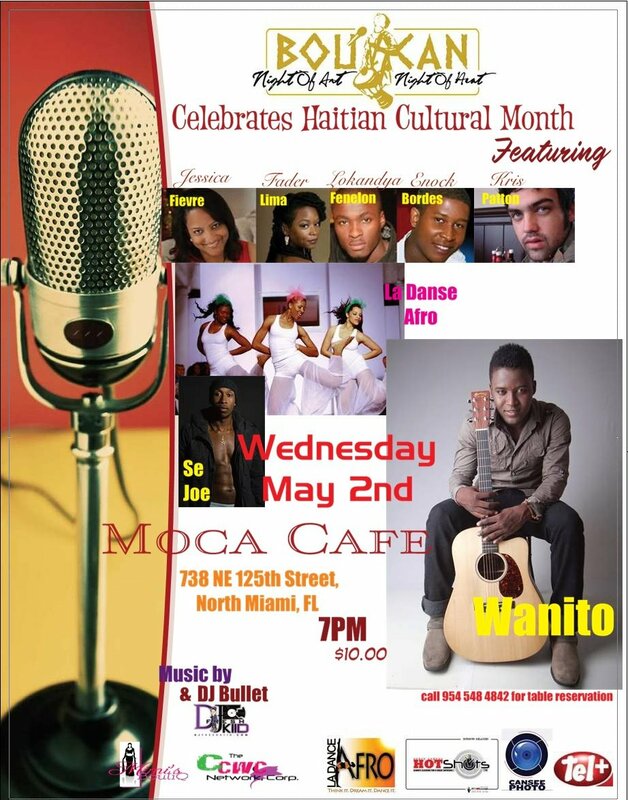 M.J. Fievre, Haitian writer/educator, will read from “So Spoke the Earth,” and Naples author, singer/songwriter, Carlene Thissen, will sing. Submissions to: creativewriterehr@gmail.com by 01/10/2014. Everyone is welcome to come and enjoy the evening. Andrea Askowitz, Jan Becker, M.J. Fievre, M. Evelina Galang, Nicholas Garnett, and Fabienne Sylvia Josaphat on All That Glitters: Non-Fiction from Sliver of Stone Magazine. 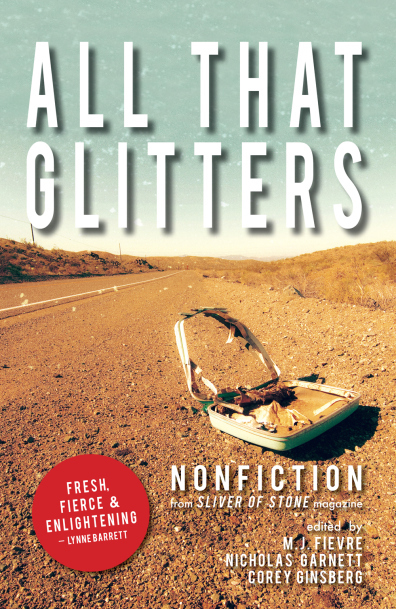 The 15 nonfiction stories published in the literary magazine Sliver of Stone’s first anthology, All That Glitters (Lominy Books; $15.00), recount lives and identities unsettled by the scary, but irresistible pursuit of truth. Also included are interviews with award-winning nonfiction writers, including Susan Orlean and Dinty W. Moore. Flash NON-fiction is an exciting and nuanced genre full of possibilities and surprises; it encourages writers to be economical and deliberate. The pieces, though diminutive in length, must still contain all the elements of narrative construction. How does a writer compress events and characterization into a few hundred words? Well, come experiment and play! The workshop will be beneficial for those first experimenting with the genre and for those looking to hone their skills. Write short, think long. Registration is now open. For more information, contact Nicole Swift at nswift@mdc.edu or 305-237-3528. 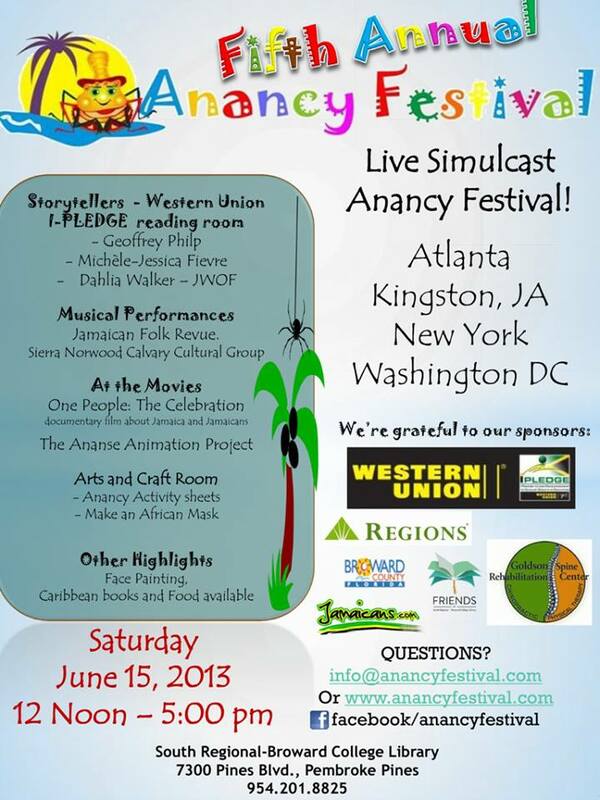 Workshops are in Spanish, Creole, and English. First-come, first-serve. ArtServe, 1350 E. Sunrise Blvd. 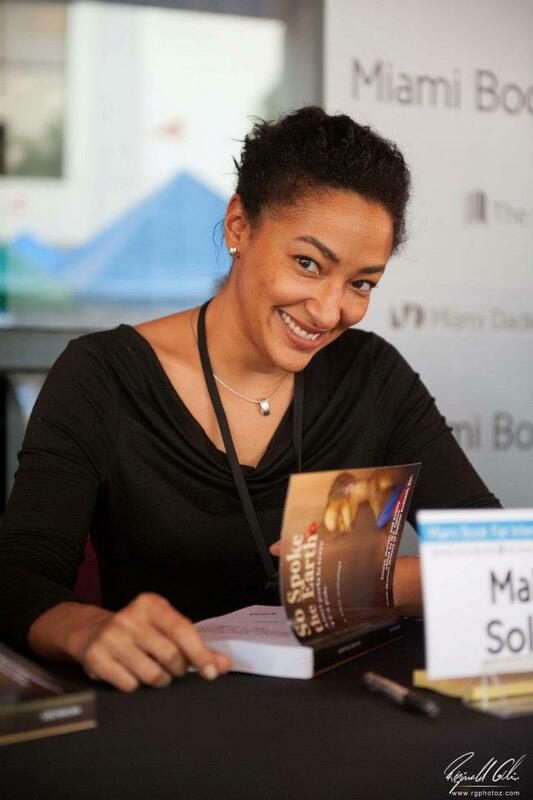 On January 27, 2013, the contributors of “So Spoke the Earth” will be at Libreri Mapou, 5919 Northeast 2nd Avenue Miami, FL 33137, to read from the Haiti anthology. This multilingual anthology of literature about Haiti explores the country’s past, present and future as experienced by its diverse inhabitants over the past four decades. 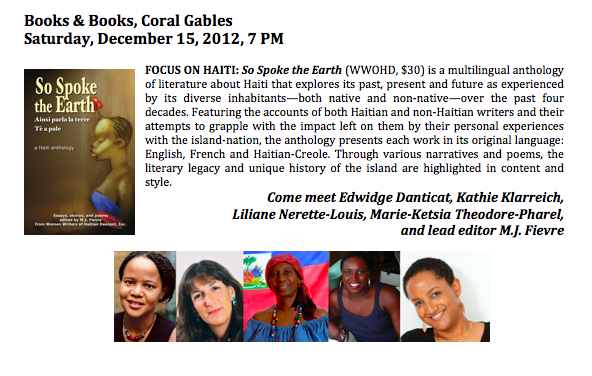 Presenting each work in its original language (English, French, and Haitian Creole), SO SPOKE THE EARTH features the accounts of both Haitian and non-Haitian writers and their attempts to grapple with the impact left on them by their personal experiences with the island-nation. Through various narratives and poems, the literary legacy and unique history of the island are highlighted in content and style. 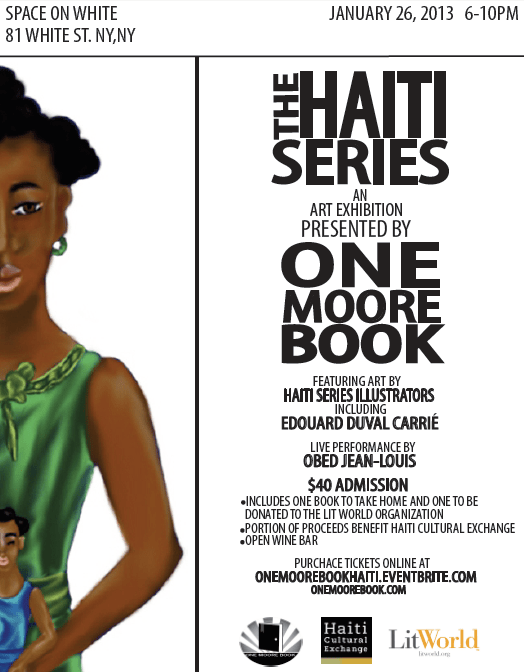 This is an important anthology about Haiti in that it is a celebration of Haitian spirit, multiculturalism and diversity. 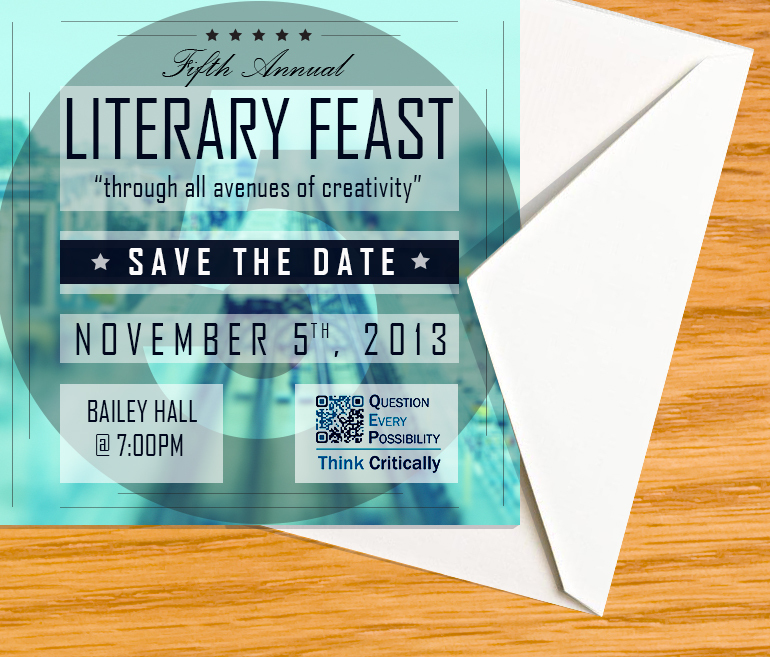 An eclectic, international combination of established and emerging writers. If you’re in Paris on Wednesday, January 23, go meet the editors of the French edition of this amazing book I contributed to: “Haiti Noir.” Reading a translation of my story “The Rainbow’s End” was quite delightful. Don’t forget to check out the uVu video and the talk with Lorna Owens. The event is also mentioned here: Three books you will want to pick up at the Miami Book Fair this year. And here: Hello, Book Lovers, the Miami Book Fair International is here. Plus the amazing Geoffrey Philp is planning to stop by to support the panel. I’ve been featured on WLRN! Check out the interview with Marva Hinton.